It's been over a month since the earthquake and tsunami in Japan changed so many lives. As with most disasters, as time goes by you don't see coverage on the news every day and the tragedy starts to fade away if you are not living with it every day. Unfortunately, I am sure there is still much suffering going on there. I was so fortunate to get connected through the blogosphere with Makiko Hastings and her 1000 birds project. Makiko is a Japanese ceramic artist living in England. 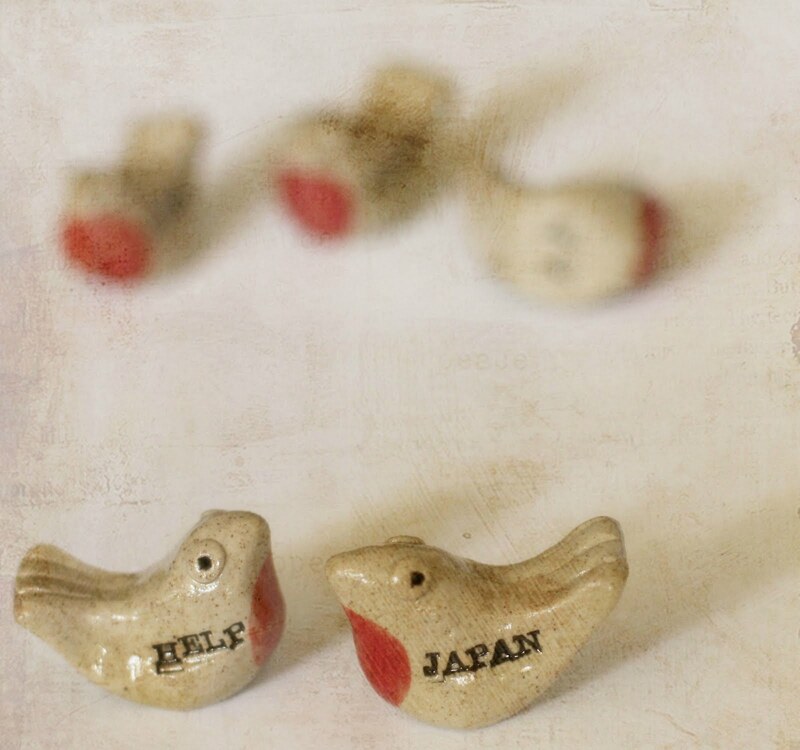 She had the amazing idea of making 1000 ceramic birds and selling them to people around the world to raise money for the Japanese Red Cross. Each bird was lovingly crafted by hand and numbered from 1-1000. I am now the lucky owner of numbers 721-725. Makiko and her husband put together a short video about the making of these birds. It's incredible to watch the detail that went into each and every one, and her thought process behind the each element of the design. I'd heard and read about this, but I'd not seen this video. Truly such an amazing labor of love, and how lucky you are to have some of them! Thank you so much for sharing this today at The Creative Exchange. Just perfect for it. This is a beautiful idea, and the birds are lovely! I had seen this somewhere, but didn't realize they had been for sale. A wonderful way to support a worthy cause. wow, what a great idea for a project! i am sure that helped out a lot. they are such cute birds too! amazing! thanks for share it! I just watched the video - so much work and love in each of those little birds. And the end result is great; very cute chopstick holders with a special story too. These are so sweet, thank for sharing! Oh! That made me cry - so beautiful and touching. How lucky you are to have a piece (or two) of that project. Thank you for sharing it. Such a wonderful project! Thanks for sharing more about this venture with us. wow that is an awesome project! how cute the birds are too! They are lovely - wish the lady was still selling them as I would definitely buy one - such a terrific cause. Ohh! That video is so touching, it nearly brought me to tears! Lovely photo of your 721-725 birds, the texture is very pretty! Great project! Your image of the little birds is lovely. love your image, and thanks for sharing the video. That was so sweet. Thank you! I always, always love the videos that you share with us.